Sunday evening Monaco tied with PSG on the 27th match of League 1, at a Stade Louis II packed with Monegasque fans, with HSH Prince Albert in the royal box, and we spotted Brazilian F1 driver Felipe Massa with his little son holding a superhero action figure, among other celebrities in attendance. The Monegasques played a defensive, match very different to the incredible win against Arsenal 3-1 at the Emirates Stadium, while Paris failed to score in spite of having more chances, thanks in great part to Croatian goal keeper Subasic who was the hero of the evening. The Red and Whites collected one point, recovering their 4th position on the table behind Marseille, but with still one match behind that was cancelled due to bad weather against Montpellier. The Parisians may blame it on the suspension of star Zlatan Ibrahimovic, or the absence of Thiago Motta and Yohan Cabaye who are on injury leave, but they have plenty of other great players like Edison Cavani, Javier Pastore, Ezequiel Lavezi, David Luiz, to name a few. “The most difficult thing in football is to score goals. It’s one thing to create chances but you have to score them,” said Laurent Blanc, the PSG coach. “It’s frustrating because in terms of the game itself we deserved more than a point.” The truth is the visiting team wasted a chance to get on the top of Ligue 1, and vice-versa the Monegasques did not succeed to gather more points to keep advancing on the ladder. Monaco coach Leonardo Jardim has claimed his players were “tired” after their recent Champions League victor. “It’s the fatigue of having played a top-level game such as that against Arsenal. This evening we played against the best team in the league, so it’s a good point,” Jardim said. 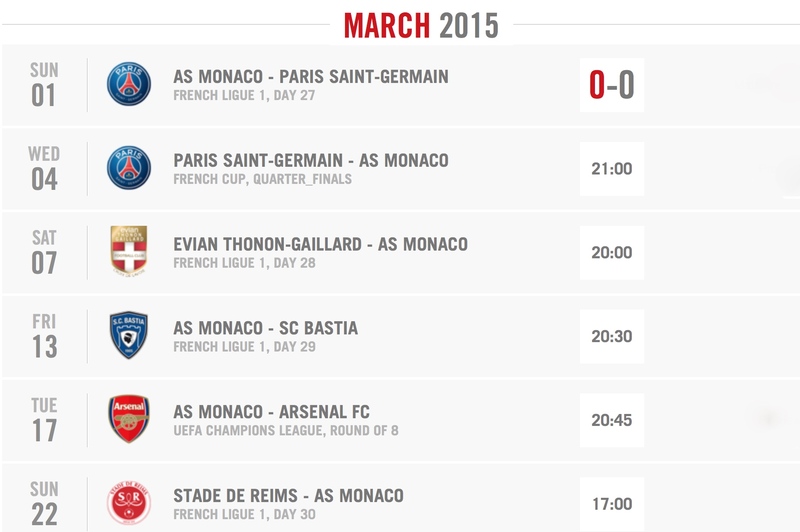 PSG and Monaco will meet again this week on Wednesday, March 4 in Paris for the French Cup quarterfinals. The Red and Whites are wrestling to keep going strong on three fronts in spite of having a reduced group of nineteen players plus the goalkeepers. Out of four defensemen, two are suspended and the two other injured.